[the following is my sermonette from our Downtown Good Friday Service. 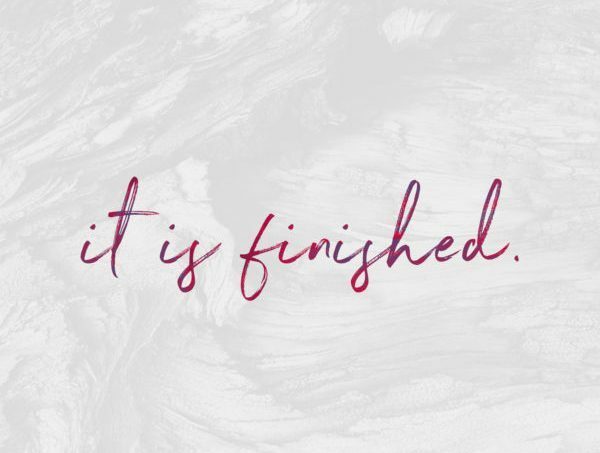 Jesus’ sixth word—his penultimate line before succumbing to death—was both simple and significant: IT IS FINISHED. It’s hard, if not impossible, to know the tone with which Jesus uttered these words. Our culture is one that fears and avoids death like the plague. But I choose to believe, based on the quiet strength Jesus has exuded throughout the day we know as Good Friday, that these words—it is finished—are spoken with a peaceful confidence. Jesus had lived in the emotional chaos of Holy Week. He had experienced the excitement and high of Palm Sunday—being paraded into Jerusalem as a hero. He had experienced anger about spiritual and religious abuse—chasing the cheats and swindlers from the temple and opening it again to the marginalized and poor. He had experienced doubt and fear in his time in the Garden of Gethsemane—sweating drops of blood and asking God for any cup but death. And now, almost everything he said in his final hours seems to have come from a place of peace. He offers forgiveness to his floggers, salvation to the sinner, and provision for his parent. 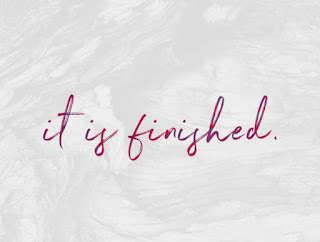 And after one more groan of agony, amidst feelings of forsakenness, Jesus arrived at the end of his life with a strong, peaceful confidence—calmly uttering, “It is finished.” Which is remarkable—and different than how we generally handle our mortality. You only say a phrase like ‘It is Finished’ with peace and confidence—like Jesus does—if you have a depth of understanding about the temporal nature of this life, a confidence in our God-given calling here in this world, and a deep-seated trust in God for the life to come. May we all have that sort of peace about the inevitable finality of this earthly life and the beautiful promise of the life to come. If God is making all things new—reclaiming this world for himself—then we can confidently live in the temporality of this life. Let’s do all we can in this life to further God’s kingdom of love, blessing, healing, and salvation. Let’s live the kind of life now, where we can one day say, “I have fought the good fight, I have finished the race, I have kept the faith.” Let’s live lives—here and now, not waiting one more second to get started—that are so beautifully attuned to the words and ways of Jesus, that we will one day be able to say—with peaceful confidence—it is finished. In my sermon yesterday, I mentioned an idea that I hadn’t done much thinking about, wasn’t in my notes, and I hadn’t planned to talk about. In discussing the week-from-hell that Jesus was embarking upon as he sauntered into Jerusalem on Palm Sunday, I mentioned that it would be a week of evil. And it truly was an Evil Week—despite the fact we call it Holy. The same is true when it comes to the ‘goodness’ of that Friday. It truly was a Bad Friday—despite the fact we call it Good. We only call these events ‘Holy’ and ‘Good’ out of hindsight. We know the ending of the story is Holy and Good, so we have retrospectively tagged the week as ‘holy’ and the Friday as ‘good.’ But for Jesus, the week was nasty and the Friday was torturous. And even for the first disciples, the week would have been confusing, dangerous, and maddening to witness, while that Friday would have been sad, excruciating, and disorienting. They have just watched their friend be killed and now this movement they have dedicated three years of their life to has come to a grinding and unfortunate halt. There was nothing ‘holy’ and ‘good’ about that week and that Friday. So, for us 2,000 years later, with the privilege of hindsight, we must be cautious to not-too-quickly move past the evil, bad, painful, and torturous elements of what we now know as Holy Week and Good Friday. Yes, we know that Sunday is coming and the hope of resurrection is just around the corner, but let’s patiently wait for Sunday while we faithfully dwell in the ambivalence of this week. Let’s allow the evil of the week to remind us of how much evil we still see in the world today. Let’s allow the treachery of Judas to remind us of how easily we turn our backs on God and others. Let’s allow the mockery and violence of Friday to remind us of how often we scapegoat others and resort to violence in solving perceived problems. Let’s allow the loneliness and confusion of that Saturday to remind us of how often we feel forsaken and sense God as absent, even though he’s generally preparing his next miraculous intervention in our lives. Let’s not too quickly race ahead to Sunday, while neglecting all that God might reveal to us and teach us through the pain of ‘Evil Week,’ the horror of ‘Bad Friday,’ and the desolation of ‘Lonely Saturday.’ And I trust that if we will do so—if we will allow each day of this week to be what it is and to sit in the emotions that the original Holy Week elicits—then the joy of Easter morning will be that much more ecstatic and the clarity of Jesus’ resurrection will be that much more illuminating.